Hello, I'm interested in finding out more about your Bring peace of mind to your loved ones. Pre-arrange your funeral service with Osheim & Schmidt Funeral Home. Details for Bring peace of mind to your loved ones. 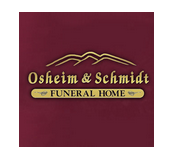 Pre-arrange your funeral service with Osheim & Schmidt Funeral Home.